It’s from “How to Train Your Dragon,” a movie that I thoroughly expected to hate after the way they advertised it. Does anyone remember the last winter Olympics when they had the unending barrage of commercials? And not only that, but the annoyingly-accented characters who kept popping up in on-screen graphic ads, and then actually competing in these stupid little Viking Olympic games? Grating. I loved it. But not until halfway through, when Hiccup was flying for the first time (and it was really so beautiful on the big screen). Here’s the scene that gets me to this day. In case you haven’t seen this movie, it’s about a Viking (named Hiccup – another reason to find it annoying) who traps a dragon but doesn’t have the heart to kill it. The dragon is injured and can’t fly away, so Hiccup brings it food and builds it a new tail. But the tail only works if Hiccup can ride the dragon, so they have to be friends. The dragon, Toothless (again – really? Were they pulling names out of a hat on this one?) isn’t totally down with that idea so he’s staying away from Hiccup, but he realizes he needs Hiccup to fly. So they literally do a dance around each other, trying to learn how to communicate. Hiccup has been trying to get close to him but every time he does, Toothless runs away or dragon-screams at him. 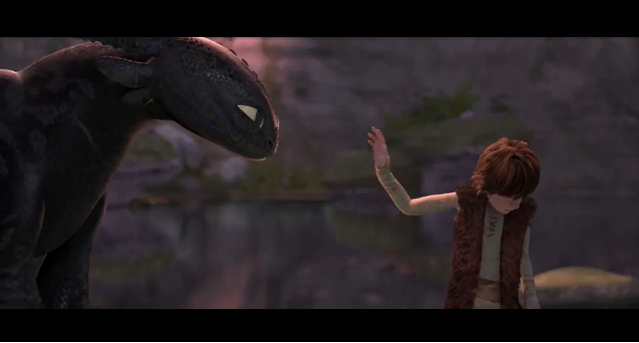 Finally Toothless lets him get close, but when Hiccup reaches out his hand to touch him he growls. Hiccup takes a deep breath, holds out his hand, closes his eyes, and turns his head away and down to the ground in a moment of submission. And the dragon nuzzles his hand. Ugh! And I start to cry!!! Because they’ve shown how delicate and rare trust is – how hard it is to build and maintain. And that sometimes we have to be humble to deserve it. And in a matter of seconds someone has illustrated a deep and lovely emotion that, as usual, would take me a whole blog post to convey. I know that movie makers are paid a lot of money to do this, and my heartstrings are being plucked purposely so I’ll run out and buy some Toothless merchandise, but the movie makers don’t always get it right. And it’s not always so evident. That’s why I love a good movie. It reminds me to go home, sit quietly with someone I love, let them give me what they have, and receive it with the honor that it is due. This entry was posted in Behavior and tagged be nice, feelings, trust by Amy Pybus. Bookmark the permalink.